Did you hear? 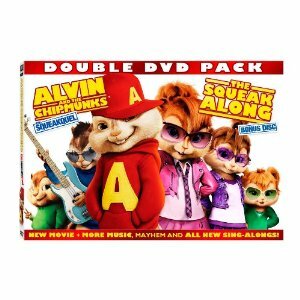 Alvin and the Chipmunks: The Squeakquel is available on DVD, Blu-ray and Digital Download!! Can't wait to watch it with my little granddaughters. The Double DVD pack also comes with a bonus disc "The Squeak Along" with lots of singalongs. Peanut in particular is really getting into singalongs with finger and body movements. We've been doing 'Eensy Weensy Spider' lately and she loves it. Muffin really watches and wants to repeat and repeat, but doesn't quite have the motions down yet. I remember the tunes from when I was younger... drove my parents nuts!! I particularly liked all the mischief that Alvin got into. The three little chipmunks - Alvin, Simon and Theodore - really get into a lot of trouble while trying their best to stay out of it. Just a lot of good clean fun for the whole family to enjoy. This is definitely a must have for our home collection - yep, we're going to be watching it over and over again. This is a family friendly film and all the kids are going to want it. Rush right over and buy it now you won't be disappointed. If the kid's are looking for something fun to do on the computer visit http://www.munkyourself.com and 'munk' yourself! Your kids will have a blast with this! I went and did it and I even had a blast. If you are looking for More Munk Mayhem visit http://www.foxfamilyflicks.com! Gotta say I'm ready for this after weeks of The Little Mermaid, Cars, Bolt, need I mention more? When you start remembering lines from the movies you know you've got to change the pace. But for now I'm looking forward to a little Alvin action. Alvin is fav at mine house.